No matter what special occasion Fran’s bears might be celebrating throughout the year, one thing remains the same: They’re wool through and through, and so are their accessories. Felting needles 3 inches long pierce a roll of wool fibers. Thick foam protects the work surface below. Fran Bowen will pierce the roll many times before it becomes the torso of a bear. Every June, Fran attends the Estes Park Wool Market and stocks up on unspun sheep’s wool, both natural and dyed. She has tried other types of wool but finds that sheep’s wool has just the right crimp for felting. Two weeks ago, “Handmade on the Front Range” featured Mickey Ramirez, who pours warm, soapy water on clean, carded sheep’s wool to begin the process of making felted wool fabric. What Mickey does is called wet felting; what Fran does is called needle felting, and it requires no water. Felting needles have small barbs near their points. The barbs catch the wool fibers and make them tangle – a process made possible because of tiny barbs on the fibers themselves. Fran likes to use two fine-gauged felting needles simultaneously when she works on large areas. In the picture at left, three-inch, fine-gauge needles pierce a roll of wool that she pulled from a long mass of fibers called roving. A thick piece of foam prevents the needles from contacting a hard work surface. Fran Bowen used needle felting to create a candle and attach it to this felted wool bear. The scarf and the book are made from recycled wool fabric. Fran will pierce the roll of wool many times from many directions to strengthen it and shape it into the torso of her next bear. Fran exercises artistic license to make the bears’ feet large for stability, but she also felts them until they’re remarkably flat. The head and arms will come from separate pieces of wool, fastened onto the torso by piercing them with the felting needles. No stitching is required. To make features like eyes and noses, Fran takes a small pinch of black wool fiber and pierces it in place. Fibers spread in every direction at first, but Fran keeps pulling them toward the center and piercing them down until a small, clearly defined circle appears. 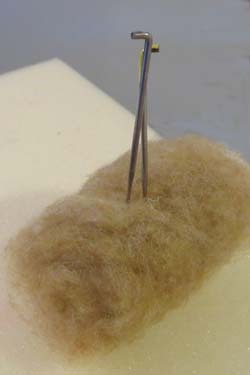 Next she changes the angle of the felting needle; instead of piercing the eye or nose from directly above, she approaches it from the sides all the way around the newly formed black circle. That secures the eye or nose so that it would be very difficult to pull off. 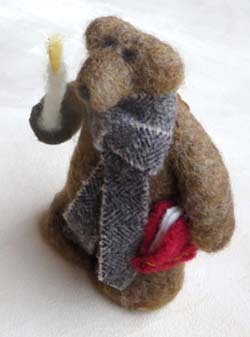 Even the candle held by the bear pictured above is made of unspun wool. Fran used her felting needle to attach it to the bear’s paw. 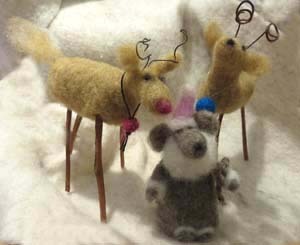 Fran Bowen uses sticks for legs and wire for antlers to complete her felted wool deer. The deer on the left ressembles the white-tailed deer she once enjoyed in Wisconsin. Birds and deer are among Fran’s favorite animals to make. When finished, they represent her feelings for them and memories of them. Unlike the bears, the birds and deer aren’t entirely wool. The birds have tiny beads for eyes, sewn on so carefully you can’t see the thread. Their wire feet, wrapped with brown floral tape, give them stability. Fine twigs do the same for the deer, which can stand easily without support. A small drop of glue hidden inside the body holds the wire feet and wooden legs securely in place. The same goes for the deer’s antlers of wire. A bear angel and its feathered friend watch over Fran Bowen’s booth at the Fort Collins Holiday Artisan Market. Both figures are made of felted wool. Fran’s memory of white-tailed deer from her years in Wisconsin inspired the long, upturned tail on the deer at left above. In this case, Fran pulled wool away from the body to create the tail. 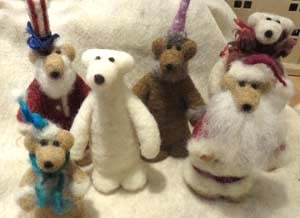 She creates fuzzy white beards on Santa ornaments and on animals in much the same way. She still pierces the white wool to connect it to the face, but she lightly pulls the fibers away from each other to create the illusion of hair. The technique worked as well for the fluffy white wings on the bear at right. This angel bear and its small “feathered” friend watched over Fran’s booth at the Fort Collins Holiday Market recently. Did you notice that the Santa mouse (pictured above with the deer) has his tail draped over his arm, as if he were a Roman senator holding his toga out of his way? 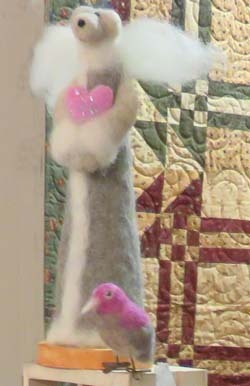 Fran used her felting needle sparingly to keep the tail lightly positioned on the arm for a delightful touch of humor. 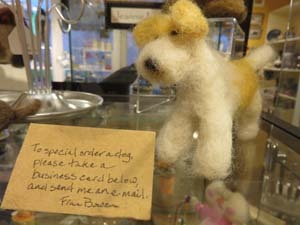 Fran Bowen makes felted wool dogs like this terrier by custom order to commemorate beloved pets. Fran’s animals and Christmas creations are hanging out at Trimble Court Artisans while awaiting new homes. Trimble Court, the artisans’ co-operative featured on October 22, is open seven days a week. Daily hours are listed on its website. This Friday, December 5, Trimble Court will be one of several galleries open until 9:00 p.m. as part of Fort Collins’ traditional First Friday Gallery Walk. Fran accepts special requests by e-mail at FMBowen@aol.com. Sometimes customers ask for a particular type of dog to commemorate a beloved pet. The terrier pictured above stands on one of her shelves at Trimble Court to let customers know they can order keepsakes. Fran expects to have a website operational in 2015. Watch the Facebook page of “Handmade on the Front Range” for announcements of her new website and other items of interest in the world of artisans and their work — including new posts!